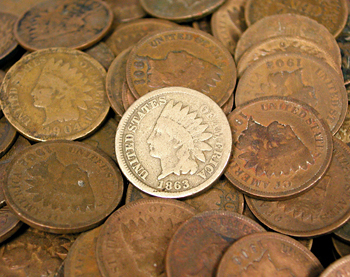 he Indian head cent was minted from 1859 to 1909. The first issue in 1859 was a thick, copper-nickel alloy  a "white" metal  that replaced the short-lived Flying Eagle design of 1856-58. The designer, James B. Longacre, had designed the first of the small cents and in 1858 designed a pattern Indian head cent using his daughter, Sarah, as the model with a feathered headdress. The reverse design featured a pair of oak leaf branches tied together with a bow. In 1860 a small shield was added to the top of the wreath, and it remained a part of the design through the rest of the series. The Civil War issues of 1860-64 were made of the copper-nickel alloy, but due to a severe shortage of coins during the war, they barely circulated. Many store tokens, chits and scrip often replaced small coinage in circulation. In 1864 a bronze version appeared; it set the standard for small cents until 1982. They were made from a bronze alloy of 95 percent copper, weighed 3.1 grams and were 1 millimeter thick. There are many scarce dates in the series, especially some of the earlier issues from 1870-77. In 1864 the initial, "L," was added to the master die, and a small percentage of the 1864 coins carried the initial. Today this is one of the key coins in the series. The other dates of the 1860s are also scarce in any grade, and very scarce to rare in mint condition. One popular variety is the 1869-9, where the top of the 9 shows a trace of another 9 (some believe it is over an 8). This variety is scarce in all grades. The key date in the series is the low-mintage 1877, which even in the lowest grades can bring a few hundred dollars. In mint state, the prices can run into the five figures. Starting with the 1879 issue and continuing through the last date, 1909, the mintages were fairly large, and these dates are considered common in circulated grades. One ad from Ben's Stamp and Coin Co. in 1946 advertised 500 mixed, used Indian head cents for $10  postage paid! One could assume 99 percent of the coins were dated from 1879-1909. In 1908, the San Francisco Mint issued its first cent (1908-S). It is not rare, but it is very popular, with lower-grade coins selling for $50 and mint state coins for $300 and up. In 1909 the San Francisco Mint struck only 309,000 Indian head cents, and these are quite scarce, with lower-grade coins bringing $200 in the lowly "good" condition to $1,000 in mint state. Today, common-date Indian cents can be found for less than $1 at most coin shops. Each year of issue also saw a small number of "proof" coins minted for collectors. These are especially scarce and often very colorful. The copper-nickel proofs run from about $600 each into the thousands, depending on grade  PR65RD being the preferred grade for specialists, where "PR" stands for proof, "RD" means a reddish hue, and "65" represents its state of preservation on a scale of 1-70. The key proof coin is the 1864-L; only 20 pieces are believed to have been struck. Recent auction records show prices of $25,000 and up for the few specimens offered for sale. One especially nice specimen sold for more than $100,000 last year. In a 1934 price list, New York dealer F.C.C. Boyd offered an 1864-L proof Indian head cent for $27.50 and an 1877 proof for $3. Other proofs ran 50 cents to $3 for the 1870. The uncirculated 1908-S was 50 cents, and the 1909-S was 60 cents. The usual proof mintage for most dates was between 1,000 and 3,000. Most have been mishandled over the years, and the survivors often toned, colorful hues. PR63RB (RB for "red-brown") coins sell for about $300, while PR65RD coins sell for about $600. Considering their relative scarcity and beauty, they are bargains in today's numismatic field. The Indian head cent was replaced in August 1909 with the new Lincoln cent, but Indian cents continued to circulate well into the 1940s. Rarely would one show up in the 1950s, however, and virtually none beyond that. Fortunately for collectors, many were saved and can be purchased today.